Have 999 Hearts when you defeat Medusa. Have 5 segments in your health meter. Have 5 "Fighting Ability" Arrows. 0 Pit receives a hat and sickle. 1 Pit receives a plain helmet and a short stick. 2 Pit received a plumed helmet and a spear. 3 Pit becomes a huge warrior. 4 Pit becomes a huge warrior and angels fly around as Palutena kisses him. When you enter a shop, press A + B on Controller 2. If you're lucky, the prices will change, although they can go either up or down. This does not work on the Black Marketeer. 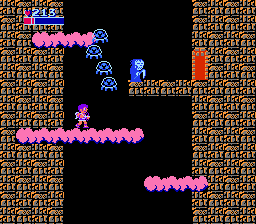 In the Japanese Famicom Disk System version, you would have to shout into the microphone on Controller 2 for the same effect. One of the flying type enemies that appears in the Sky World is Komayto, a seethrough creature with protruding teeth and three internal nuclei. Its design is based on the Metroids from the Metroid series, with the first Metroid game released only 4 months earlier. The name has been localised from the Japanese "Kometo", which would more accurately translate as "Child Met".